It was bittersweet last weekend as Stripped Screw Burlesque bid farewell to founding member and Burlesque Hall of Fame competitor Randi Rascal and the Capitol Hill-ebrity Wiggy Stardust. As Jessica noted in her preview of the troupe’s latest run Disney After Dark, the girls welcome two of Seattle’s burgeoning talents Kutie LaBootie and Kylie Kyote in Randi and Wiggy’s stead. In addition to these two primo newbies, special guest stars Bella Bijioux, Trojan and Paris Original as well as Sir Richard Longfellow contributed to the Stripped Screw’s naughty spin on childhood classics. In an attempt to create continuity between acts, this emcee-less troupe (save the brief voice-overs emanating from the sound booth), schooled Sir Richard Longfellow in what it takes to be a Disney diva. At times an ambitious endeavor, Sir Richard’s disrobing, or should I say “re-robing”, certainly contributed a comedic flare to the tight transitions between acts. Paris Original broke free from his role as pick-up artist for an en pointe satire of the traditional prince-seeking common in Disney’s mid-century fairy tale animations. 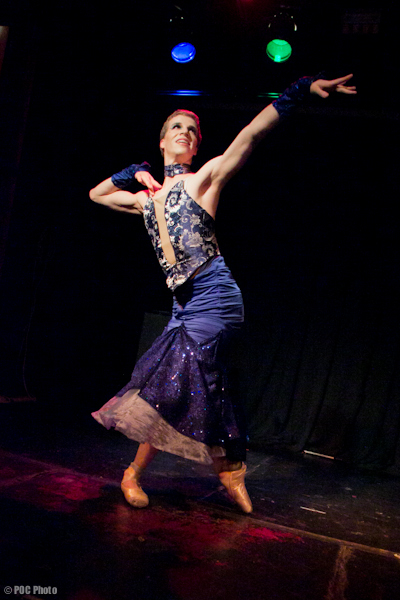 Without exception, the evening’s highlight performance came from another classically trained dancer- Violet Tendencies. Her duet with Trojan Original, as the princess who simply wouldn’t wake, provided the audience an absolutely superb example of neo-burlesque, combining beautiful movement with some of the raunchiest undertones I’ve seen in act. In addition to the subtly of on-stage perversion, Violet’s choice in music, neither heavy-handed nor irrelevant, maximized the emotional qualities of her number. I’ll be keeping my eyes open for her future creative endeavors as I’m certain good things are to come. Violet and fellow Stripped Screw troupe member Minetta Lane will be producing their first show as Valkyrie Productions on July 15th and the 22nd at the Rendezvous. Sideshow Sirens: A Valkyrie Peepshow will feature Minetta Lane, Fannie Beaverhausen, La Petite Morte, Kutie LaBootie, Kylie Koyote, Tin Pan Sally & her paramour The Shanghai Pearl, Trojan Original and Seraphina, with Candy Apples, Laela Lovechild and special guests Mercury Troy and Iva Handfull on July 22nd. Purchase your tickets ($15 adv/$18 dos) at Brown Paper Tickets HERE. ~ by angrytruffle on 07/04/2011.